Devri, 4, and her mom Whitney Gneiting sign the banner on the truck that brought the U.S. Capitol Christmas tree from Oregon to Pocatello’s City Hall on Friday morning. The tree is on its way to Washington, D.C. Find a photo gallery at idahostatejournal.com. POCATELLO — Area school teachers might have noticed a few more absent students than normal at 9 a.m. Friday morning. At that time, a large crowd that included several parents with smiling children, snacking on free Christmas cookies and sipping hot cocoa, filled the parking lot at City Hall to witness the arrival of a truck hauling a 70-foot-tall evergreen. The People’s Tree will be displayed on the lawn of the U.S. Capitol Building. The tree made two of its 25 scheduled stops in Idaho — in Pocatello and Soda Springs — amid what will be a trek of more than 3,000 miles from Sweet Home, Ore., where it was cut, to Washington, D.C. The People’s Tree, which is a tradition that started in 1964, is chosen from a different state each year. Sgt. Matt Gregg, a local U.S. Army recruiter, pulled his sons Carson, a second-grader, and Hudson, who is in kindergarten, out of Tyhee Elementary School for the morning so they could participate in the rare event. Jana and Jeremy Marley brought their 2-year-old son Declan to see the tree. They recently moved to Pocatello from Aberdeen and were glad for the chance to see the tree without a long drive. “This is the first time I’ve ever heard about it coming through, so this is pretty exciting for us,” Jana Marley said. The tree was cut Nov. 2 and departed from Sweet Home on Nov. 9. It’s scheduled to reach Washington, D.C., on Nov. 25, and will be displayed the following day. It arrived in Pocatello Thursday night and was stored in an Idaho Transportation Department facility, prior to its hour-long public appearance. Those in attendance got to sign a decorative banner wrapping the Kenworth truck that’s hauling the tree. Nikki Swanson, district ranger with the Sweet Home Ranger District of the Willamette National Forest, from where the tree was selected, said it’s the first noble fir ever chosen for the People’s Tree. She explained the 35-year-old tree was originally 80 feet tall, weighing 8,300 pounds, but had to be cut to fit in the truck. 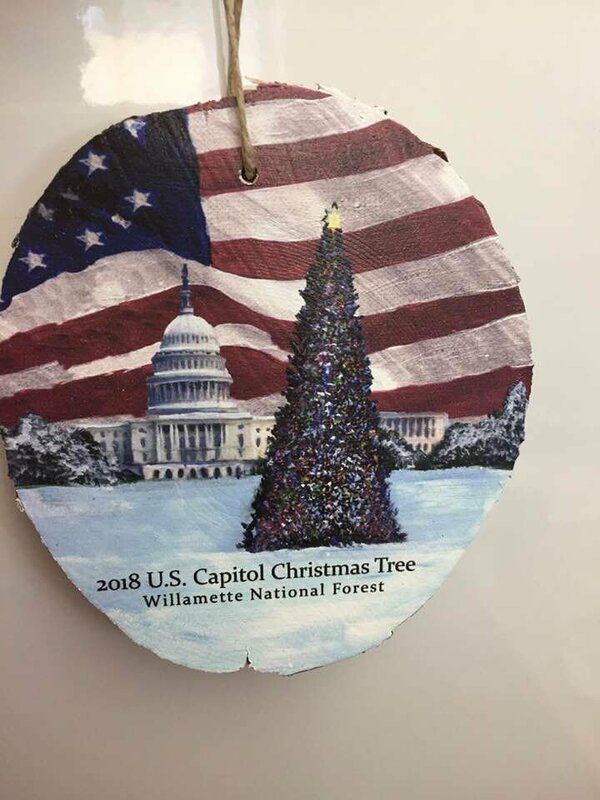 Swanson said people from throughout Oregon made 10,000 ornaments — 3,500 will be displayed on the People’s Tree, and the rest will adorn about 70 “companion” trees to be displayed throughout the Capitol Building. “They’re absolutely beautiful — everything from just the most adorable thing a kindergartner might make to something a professional might make,” Swanson said. She the tree’s route was chosen to follow the Oregon Trail in reverse, commemorating the trail’s 175th anniversary. She’s been posting a blog, linked to www.capitolchristmastree.com, detailing what she’s learned about the Oregon Trail at each stop. The website also tracks the tree’s progress, using GPS technology. Central Oregon Truck Co. supplied the drivers for each leg of the trip, selecting senior employees with the safest driving records. Danny Leon-Guerrero, a company driver from Northern California, was chosen to drive the Friday leg from Pocatello to Evanston, Wyo. His aunt, who lives in Jerome, drove to Pocatello to see him off.